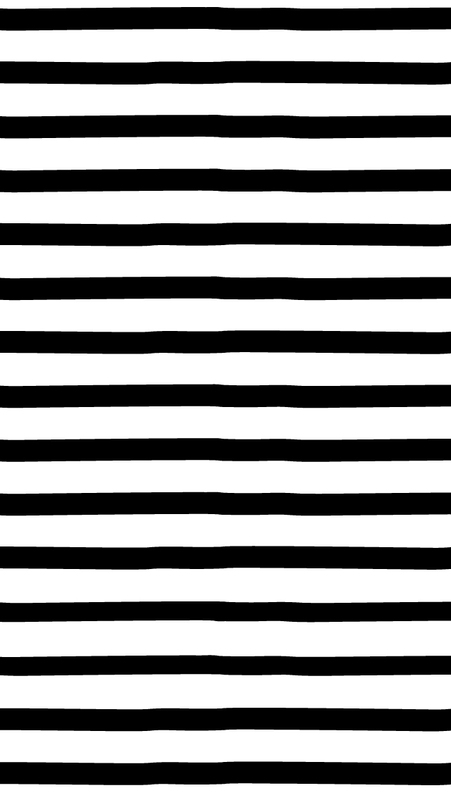 Click to download the template. 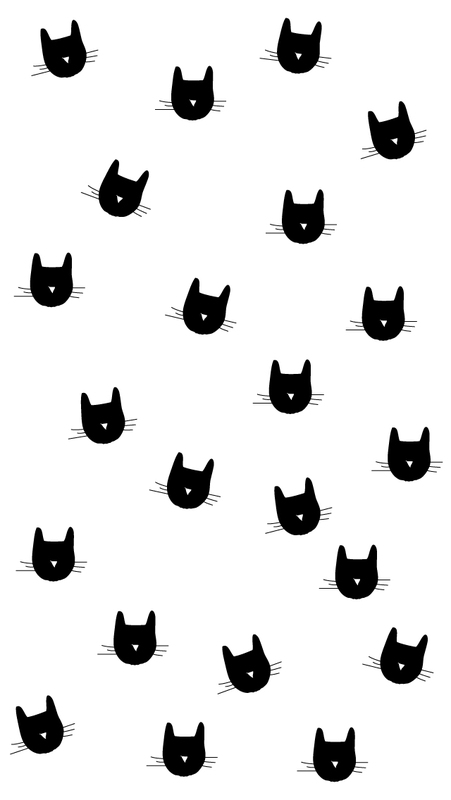 Print onto card stock and cut around dashed lines. 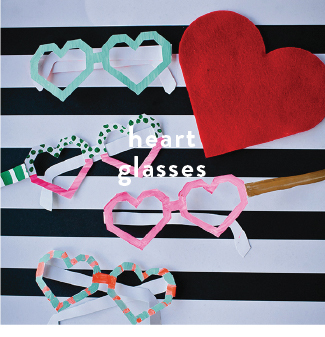 Use smaller scissors or an exact-o knife to cutout the eye holes. Trace onto black or other color card stock and cutout as before. I used hot glue to stick them to the pumpkins, but they fell off so I used double stick tape and they are still stuck (go figure)! 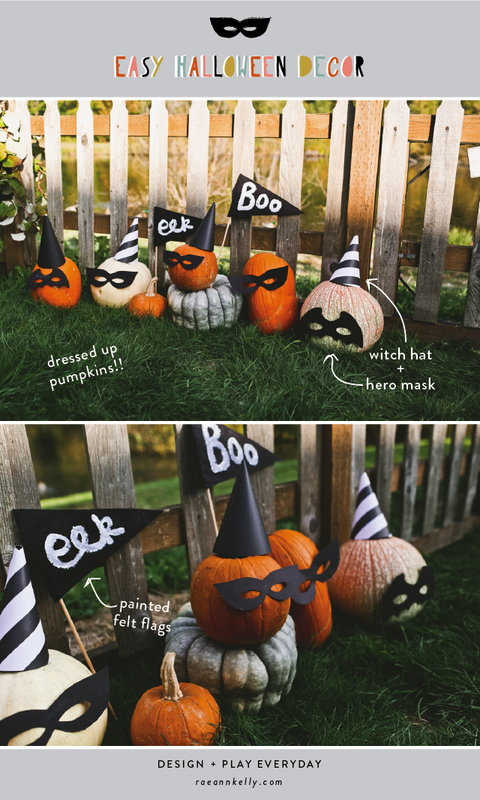 I shared small masks last year (HERE) with a “hocus pocus” banner, but turned them into a template and added a bigger size this time around. For the hats, I traced a circle tray onto a piece of poster board (card stock or other paper would work), cut around the line and then cut it in half. To make the cone shape a pulled the corners of the half circle together until it was a shape that I like and then hot glued in place. Double stick tape would work too. 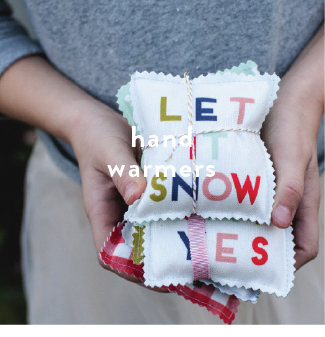 I used this tutorial to make my felt stiff (such a fun trick!). Then cut 10 x 7 -inch triangles out of it. In the past I’ve cut stencils out of butcher paper and then painted over to add words to the felt flags, but this time around I did it free hand — just a paint brush and acrylic paint which makes it easier for the kids to help too!!! Once the paint dries, simply hot glue to dowels. 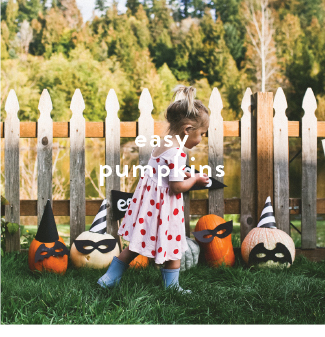 Fall decor itself is so festive there’s no need to add Halloween specific items, but I have a soft spot for whimsical or vintage designs that don’t scare the kids. 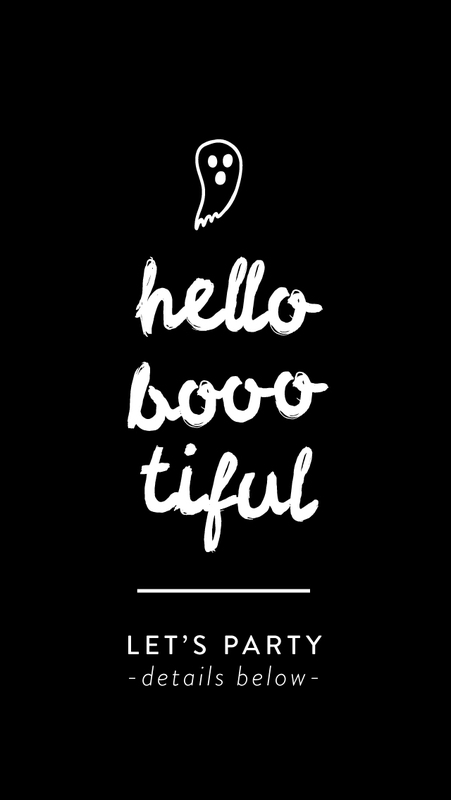 Do you decorate for Halloween or just keep things looking fall-ish!? 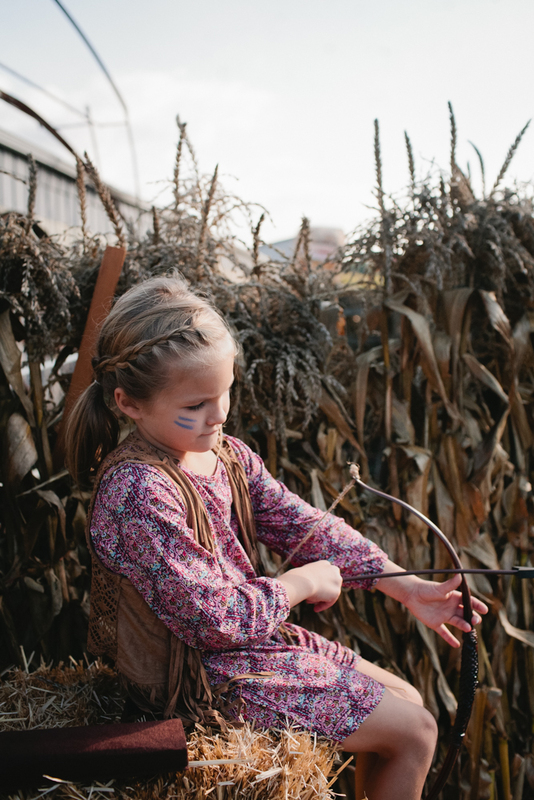 With all the B-days, Homecoming and Halloween fanfare around our house this last week it feels a little bit like the mom version of college finals (little sleep, too much coffee and lots of cramming! )… only more fun of course. 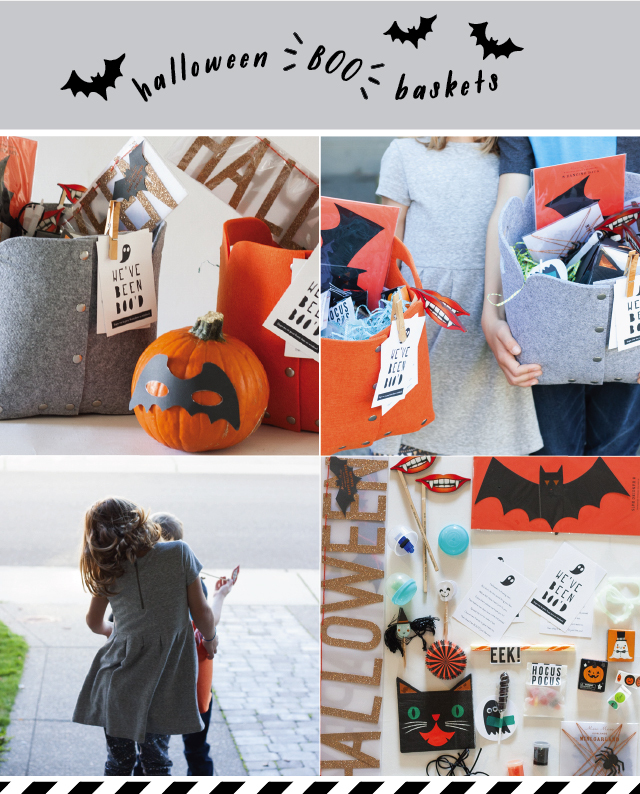 While I didn’t get a chance to finish the blog post I was planning on sharing today I was over on the Land of Nod blog on Monday sharing our latest Halloween tradition, “Boo-ing”. 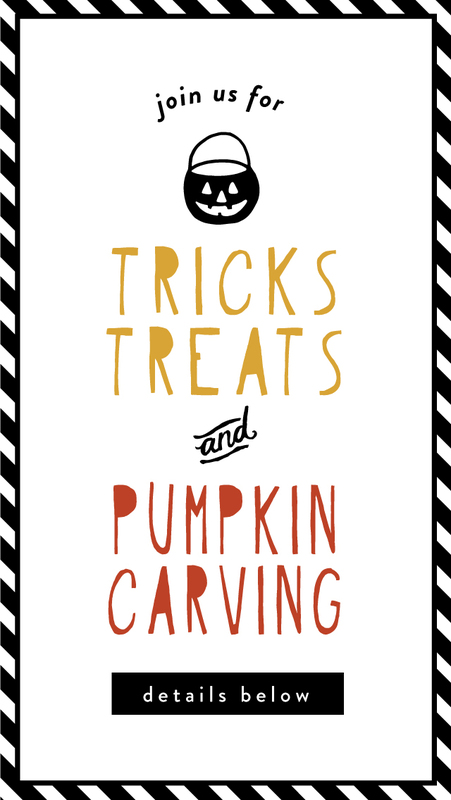 Thought I would share the link incase you have room for one more activity to add to your Halloween line-up! If not, it’s worth pinning for next year. 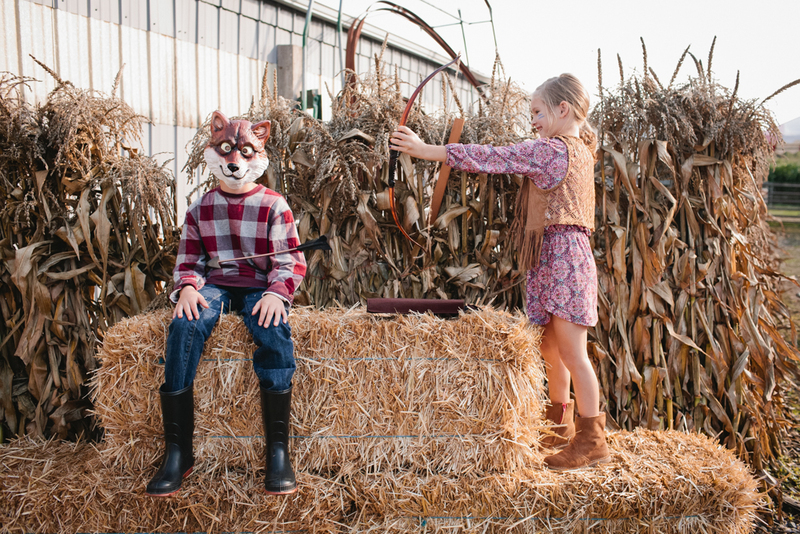 What’s been your favorite Halloween activity this year? 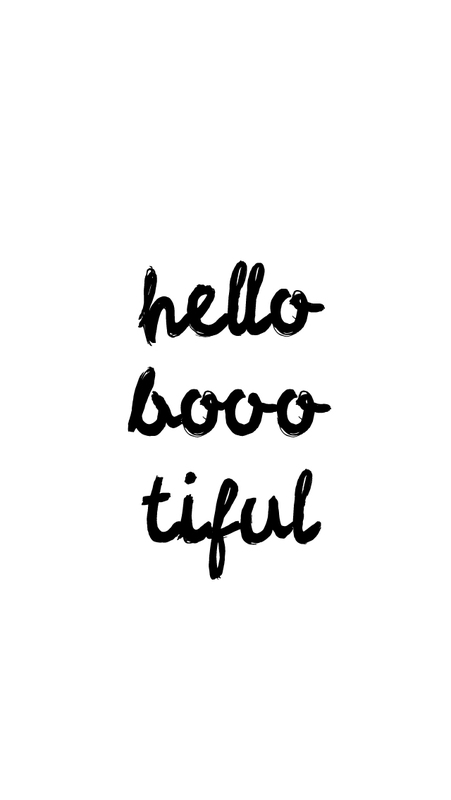 Mummies, spiders, ghosts, witches, monsters, …. 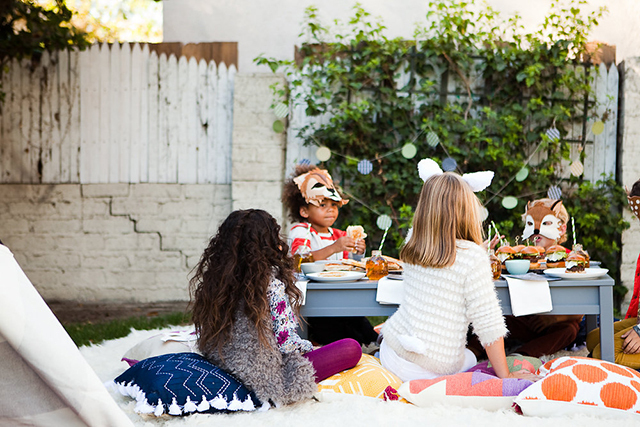 the Halloween gangs all here and ready to (be) eat! 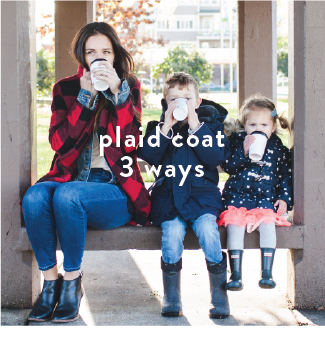 Considering all the scary things in stores and on front porches this time of year it’s nice to do things with the kids that are cute and playful instead of dark and scary. 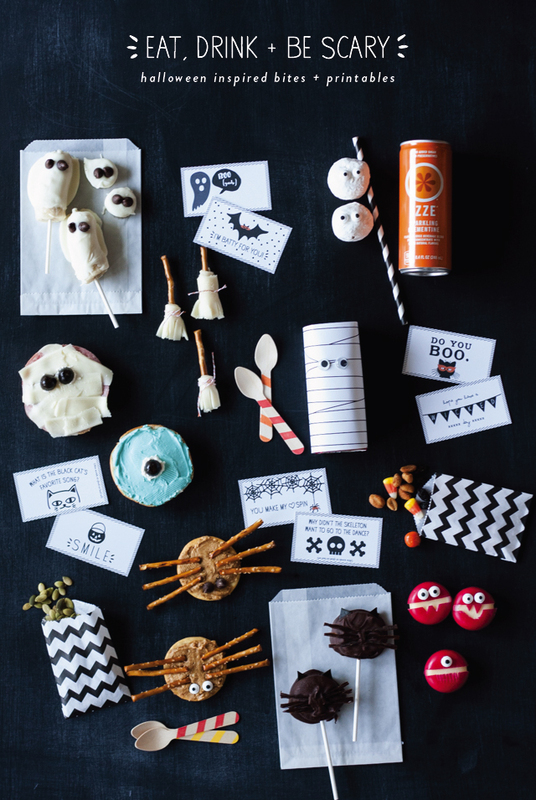 So with the help of my mini sou chefs we put together a smorgasbord of creepy (but adorable) snack ideas. 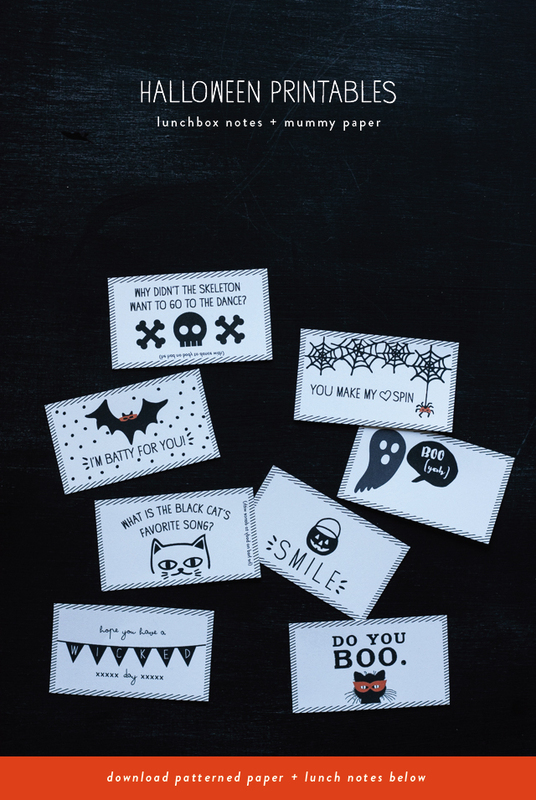 Some handmade and others store-bought as well as a free download for Halloween themed lunchbox notes and mummy paper. Food details and FREE DOWNLOAD, below! 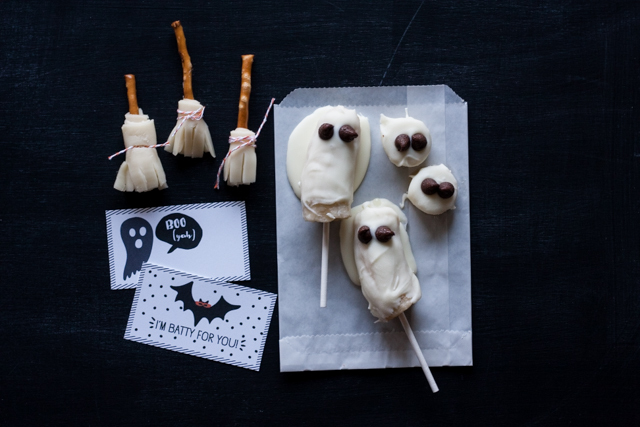 BOO-NANAS – You’ll Need bananas, white chocolate chips, a few dark or milk chocolate chips, cake pop sticks and wax paper. Cover a cookie sheet with wax paper, wax side up. Melt white chocolate chips in a bowl in the microwave or on the stovetop over low. Peel and cut bananas in half and dip in melted chocolate. 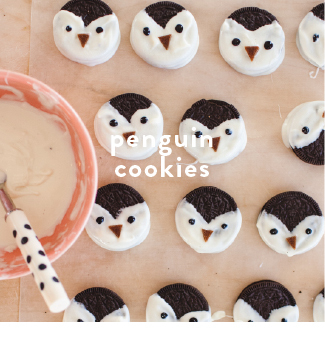 Allow extra chocolate to drip off, lay on prepared cookie sheet, add chocolate chip eyes and a stick and place in freezer. A couple of our bananas broke so we sliced them up and made little boo faces. 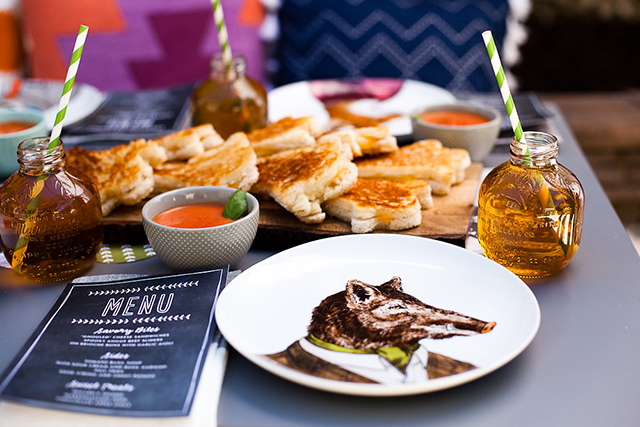 PRETZEL BROOMS – You’ll need pretzel sticks, mozzarella cheese, cheese slicer and twine (or maybe cream cheese would keep the mozzarella in place?). Use the cheese slicer or knife and cut a piece of cheese. Cut it into neat rectangle. Slice “fringe” along one long end and wrap around your pretzel about 3 times. Secure with a small piece of twine. 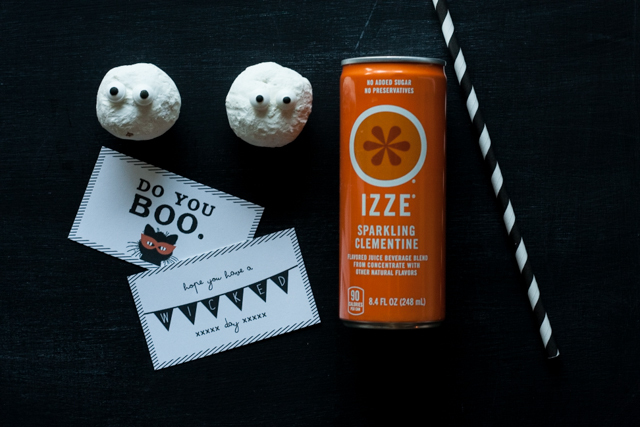 ORANGE IZZE – Add IZZE sparkling clementine drinks to your shopping list and add a festive straw! DONUT DUDES – You’ll need powdered donut holes, frosting and decorative candy eye balls (I found these at Target in the baking section. You can also DIY with royal frosting). Dip eyes in frosting and stick to the donut holes. MUMMY MILK – You’ll need a milk box, the mummy paper download (below), tape, glue stick and googly eyes. Cut the paper to size, wrap around milk box and secure with tape. Use glue to add googly eyes and your done. 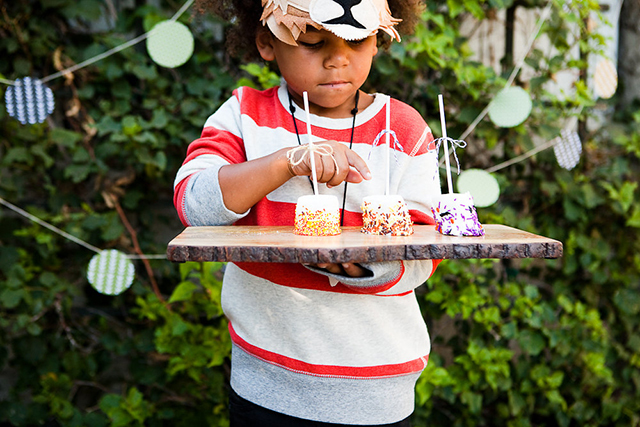 CANDY CORN TRAIL MIX – Search Pinterest for a recipe that looks good or buy at the store. 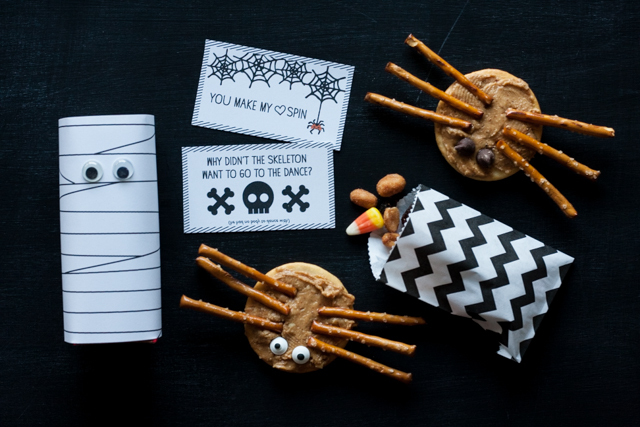 SPIDER CRACKERS – You’ll need basic round crackers (we used the bigger entertainment crackers), favorite nut butter, stick pretzels and candy eyes or chocolate chips. 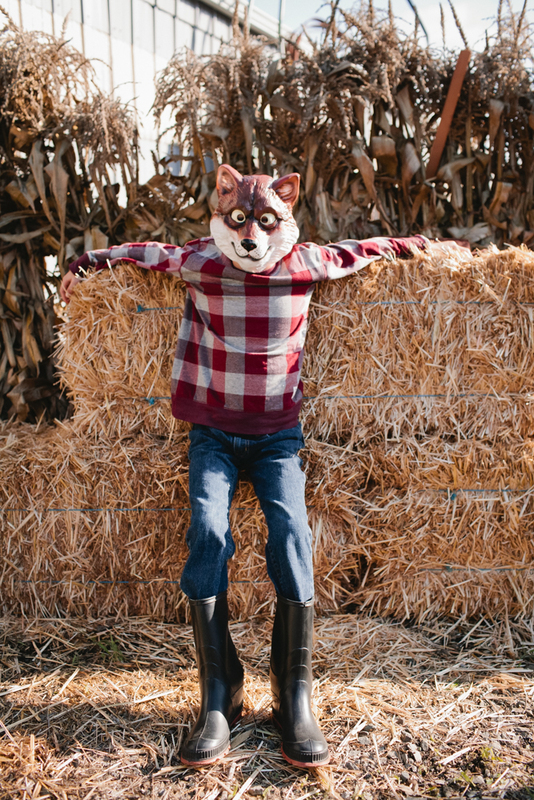 Spread crackers with nut butter, add pretzel legs and eyes. 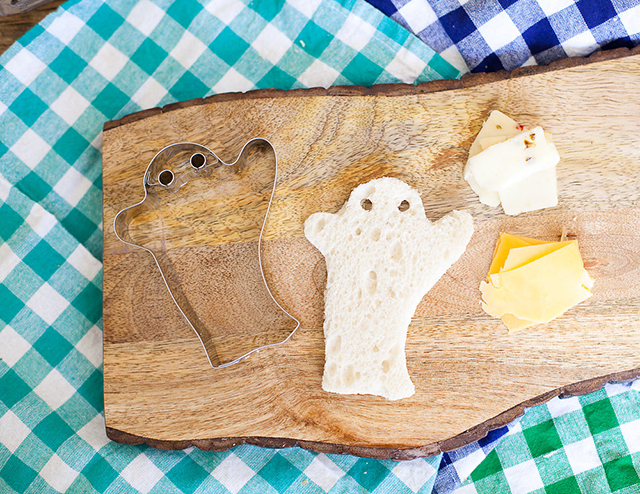 MUMMY BAGEL – You’ll need mini bagels, salami or other lunch meat, cream cheese and olives. Spread a thin layer of cream chess on bagel, and layer with a slice of salami and small slices of cheese. Slice olive in half and use cream cheese to stick to sandwich. MONSTER BAGEL – You’ll need food coloring, cream cheese, mini bagels, and olives. Add a small dab of food coloring to a scoop of cream cheese and mix well. Cut olive in half and stick to bagel using a small dab of cream cheese. 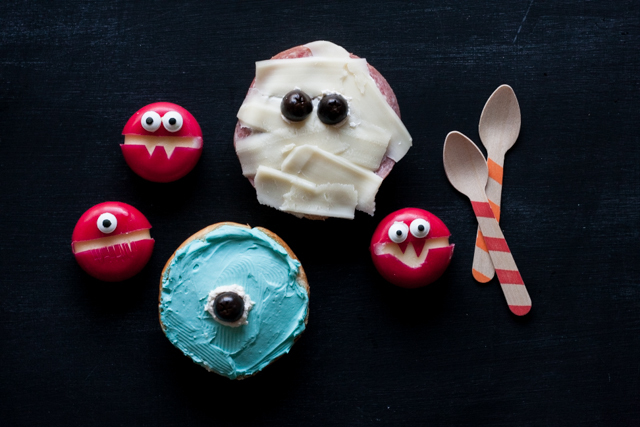 MONSTERBELS – You’ll need babybel cheese rounds, cream cheese, small scissors and candy eyes. Open babybels and unwrap the one strip of wax. Use scissors to cut wax and make monster faces. Add eyeballs using cream cheese. PUMPKIN SEEDS – Simple, festive and usually healthy! 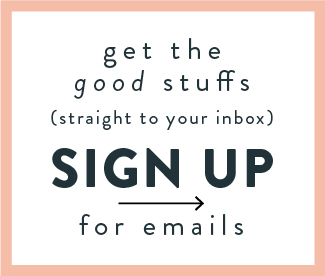 Just add to your shopping list. 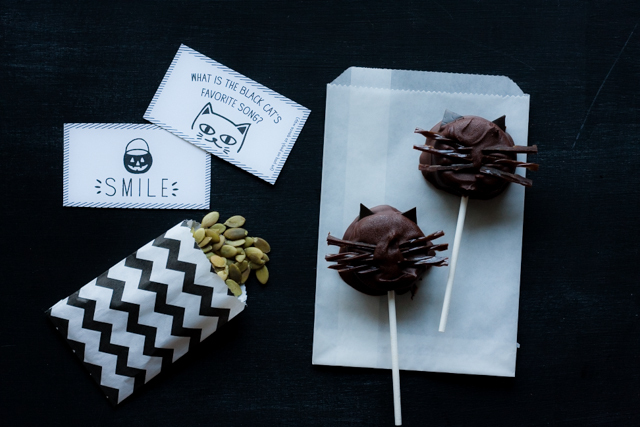 OREO COOKIE CATS – You’ll need wax paper, oreos, black licorice and/or chocolate laffy taffy, chocolate chips and cake pop sticks. Cover a cookie sheet with wax paper, wax side up. Slice taffy or licorice into wiskers. Cut taffy into triangles for ears. Melt chocolate chips in a bowl in the microwave or on the stovetop over low. Dip oreo in melted chocolate. Allow extra chocolate to drip off, lay on prepared cookie sheet, add stick, whiskers and ears and place in freezer until chocolate has hardened or you are ready to eat them! 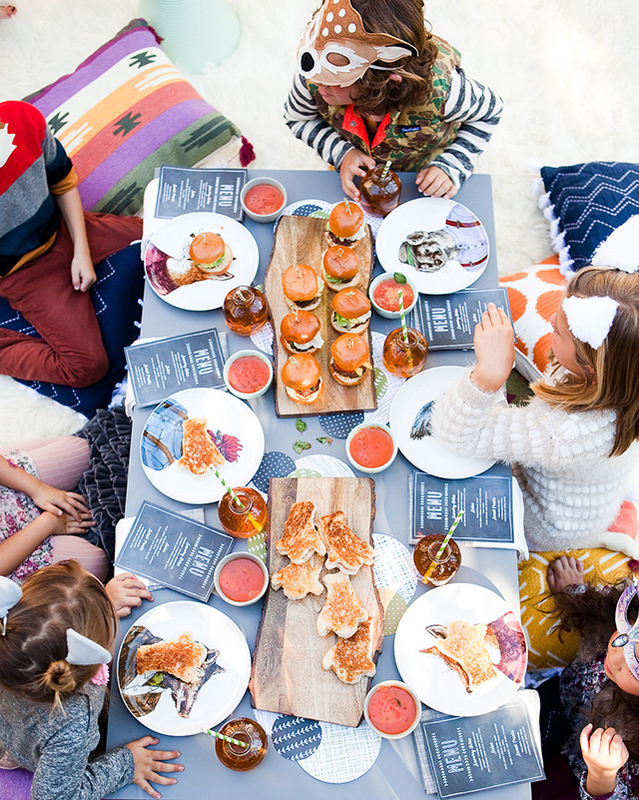 One of my least favorite things about holidays is how quickly they come and go so we’ve already been adding the notes and a snack or two to their lunches. No need to wait until Halloween day! What about you guys? 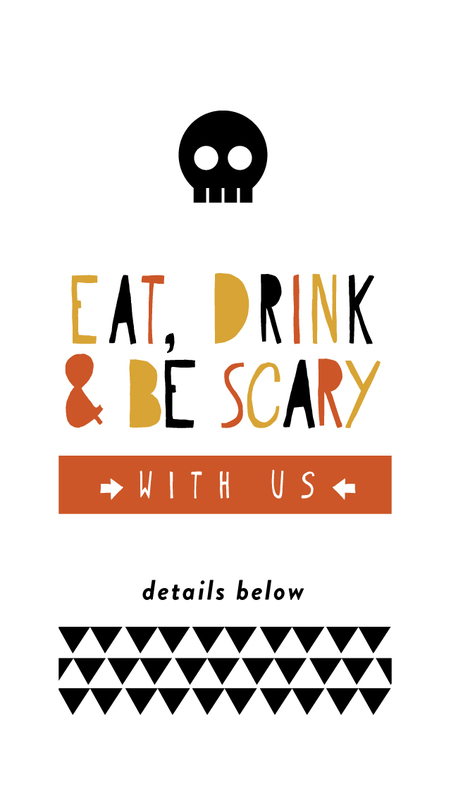 Have you had a chance to get into the Halloween spirit!? We’ve been counting down to Halloween (and a couple October Birthdays) around here and according to our calculations there are only 22 days left! Actually, 22 days seems like a long time which is probably why I’m always scrambling to put together costumes last minute. That and I can’t decide or I’m hoping a kid or two will change their mind (spiderman again!?). This year however everyone has a costume picked out and it’s either hanging in a closet or ordered and on it’s way. 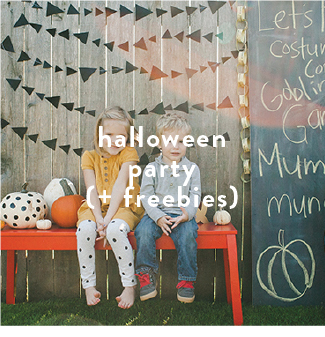 In the process of costume deciding I put together this fun Pinterest board and then couldn’t stop pinning! 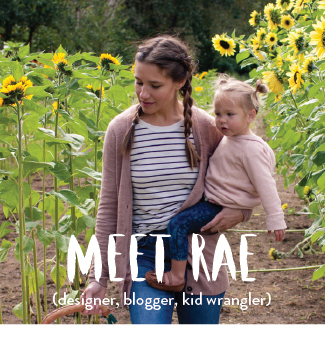 If you are still in need of some inspiration and missed the link above, CLICK HERE to check it out and follow. The bubble bath kills me… there’s so much cuteness out there, huh!? 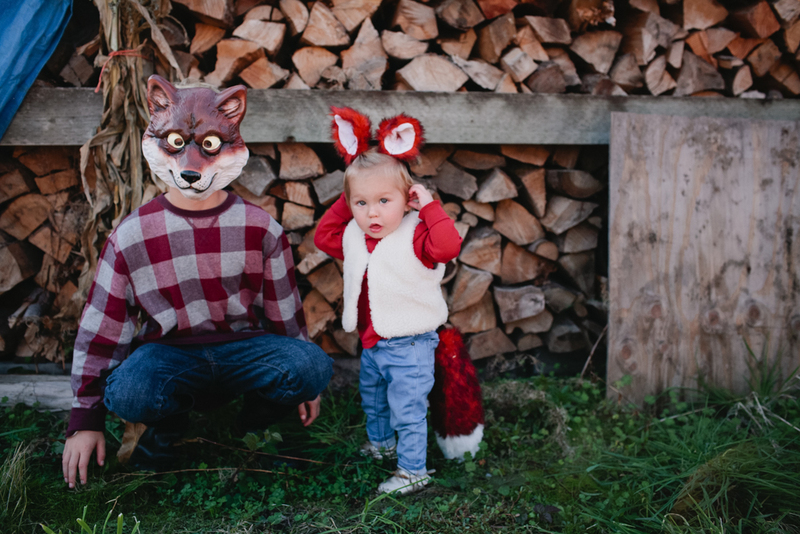 What costumes have you been dreaming up? 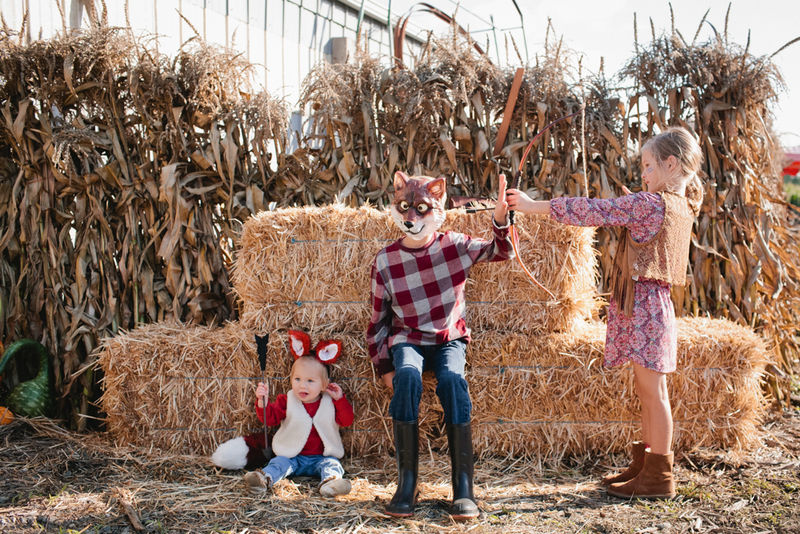 Last weekend a few of the kids and I rallied our closets, dug through the dress-up drawer, spent a few dollars at Target and threw together costumes (of sorts) for pictures at the patch. It was an entertaining way to spend our post soccer Saturday since the rest of the family had other things going on and I can’t get enough pictures of my little brood. Happy these guys obliged and had fun in the process! 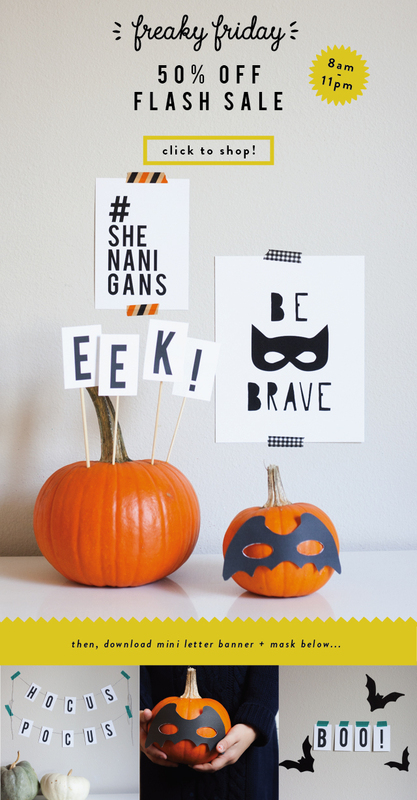 Don’t forget to let me know what costumes you have planned! It’s one of those questions I’ve been asking everyone I bump into and I love hearing all the responses. 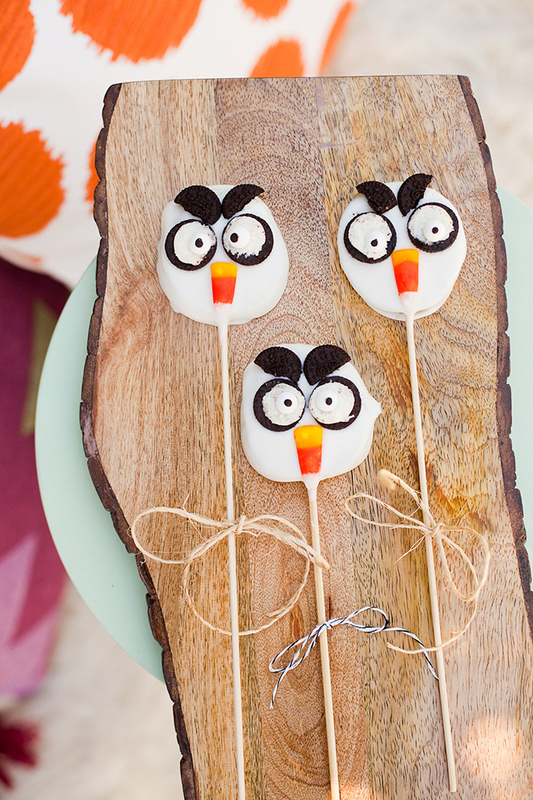 … oreo owls and dipped marshmallows. 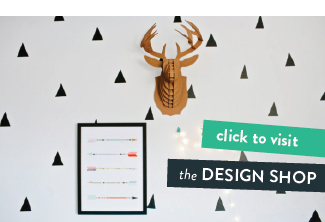 jen also used our blackboard perfection party set sold on minted which was fun to see! you can checkout more of the party on her blog (HERE). off to get everyone’s costumes organized and finished and write up a plan and shopping list for the big day. 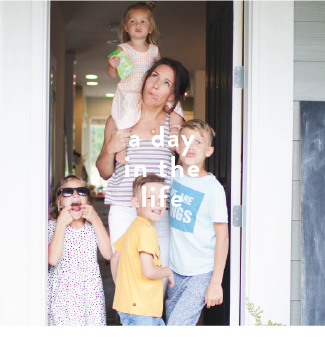 holidays are crazy around here with all these kidlets — not to mention the birthdays we have this week (oz & tilly)… i’m going to need a girl’s night asap! what’s left on your halloween to-do list!? any festive food on the menu!? 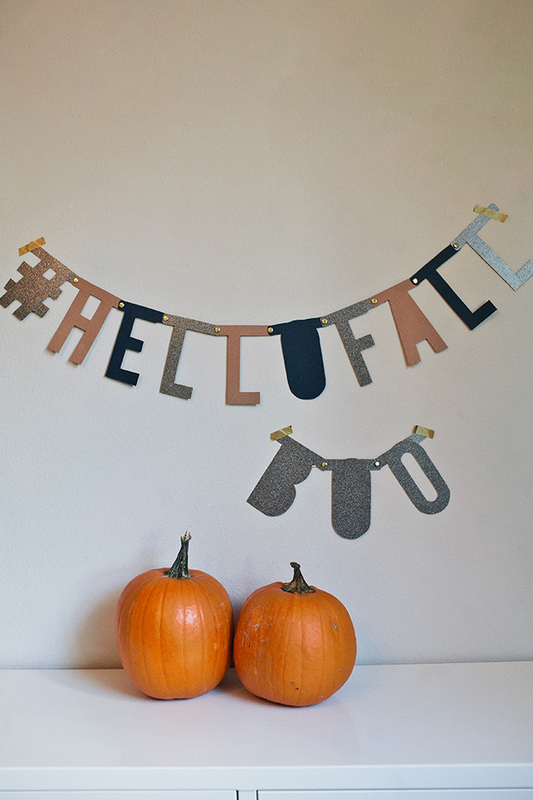 you guys… i love fall and especially october so i wanted to add to the merriment and share these fun and simple banners with you! 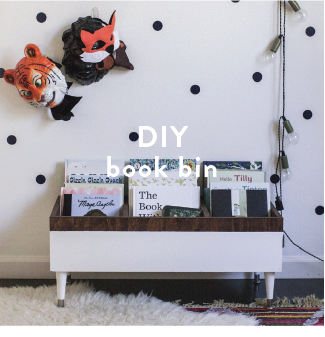 just download below, print on card stock, cut along lines with scissors (but use an exact-o knife for the middle parts if you want), hole punch and connect with brads. 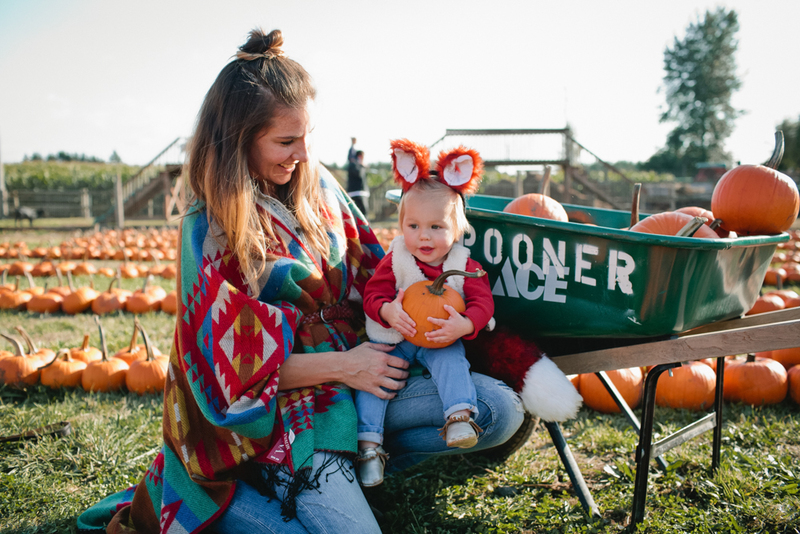 here’s to a month full of pumpkins, cozy sweaters and jumping in leaves! ps – here is another banner you might fancy.